Narrative: Frank Russell Gow was born in Bridgewater on 24 April 1923, the son of the later Walter A. and Jean (Clarke) Gow. After attending school, Gow trained as an RCAF pilot during World War II, receiving his wings in 1944. Following the war, he graduated from the Maritime Business College. Shortly after Gow went to work in the family owned hardware business in Bridgewater, along side his brother Ken in the early years. Gow served on the national board of Home Hardware from 1978-1989. Frank Gow was active in his community as a member of the Bridgewater Volunteer Fire Department for 43 years and Fire Department Band for 45 years. Gow served as Bridgewater Fire Chief from 1974 to 1983. Gow also coached the Bridgewater High School Hockey Team and was a Boy Scout Leader. As a member of the Bridgewater United Church, Gow served in many capacities Gow married Shirley Fraser and had 3 children, Peter, Sharon, Patricia. Cremation has taken place. 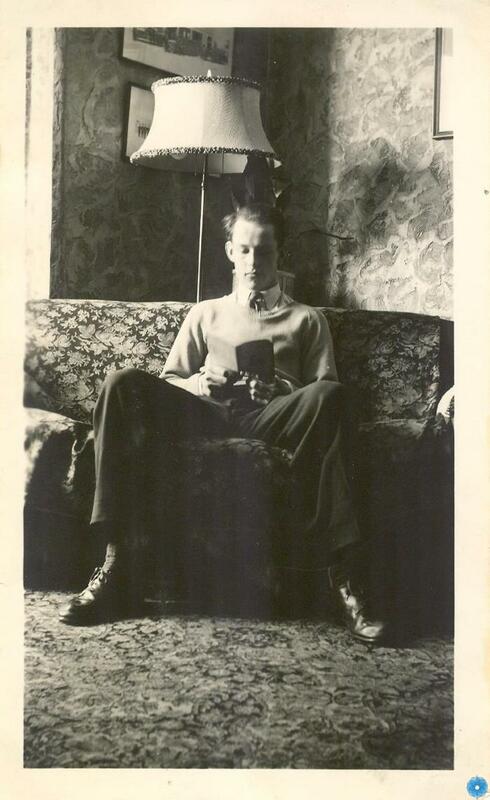 Description: Small black and white photograph of a young man seated on a floral couch reading a book, identified as Frank Gow, Bridgewater. He is wearing a shirt, tie, pull over sweater, and trousers, with dark coloured shoes. The chair has a floral upholstery and there is a tall lamp with a large shade behind the chair. Three pictures are hanging on the wall, and the floor has carpet. History of Use: Taken to document family member.